Society Zeta Alpha was founded in 1876 as Wellesley College’s literary and theatrical society. Now solely focused on literature, Zeta Alpha is the oldest of any society or campus organization with a continuous group of members. We are a proud club with a diverse group of students who also participate in various service, cultural, and athletic activities across campus. As the literary society, we hold events throughout the year related to literature: author visits, lectures, writing workshops and coffee houses (just to name a few). Open to all students, these events are often co-sponsored with other on-campus organizations and academic departments. 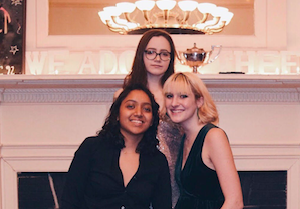 While our events vary depending on the semester, Zeta Alpha has remained true to its original goals over the last 130 years: everlasting loyalty, unbreakable siblinghood bonds, and a strong passion for literature. We live by our motto: "Ever-burning lamp a symbol of our undying loyalty." As for loyalty, Zeta Alpha greatly values its tradition of families. While all members of Zeta Alpha are siblings, the tradition of smaller sub-families provides more opportunity for specific support and bonding. Our current families, named after some of the most-celebrated writers over time, are listed below.